New Local Coffee Discovery: Red Rooster Coffee Company of Wake Forest! So it has been a while since my last post, but with the start of a new year I am determined to keep the blog rolling with a new entry every week or so as I continue to discover new things in the Triangle. 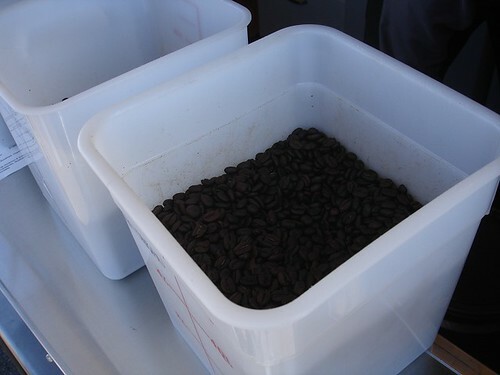 This first post for 2012 deals with one of my favorite topics … locally roasted coffee! 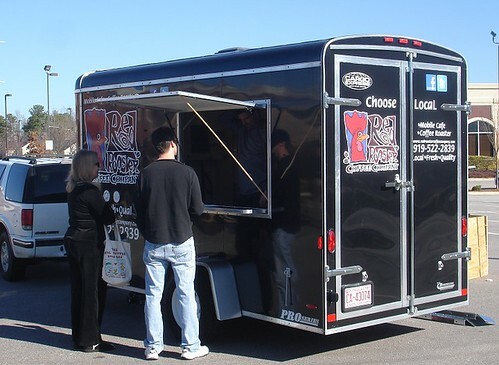 On Saturday I was driving by the North Raleigh Farmers’ Market in the Falls River Shopping Center off Falls River Avenue and Durant Road and noticed a black trailer with the name Red Rooster Coffee Company and a big Rooster Logo painted on its side. Since I am always on the prowel for the latest local coffee offerings I stopped and chatted with the owner Steve. He told me that and he and his wife run their coffee roasting business out of Wake Forest. 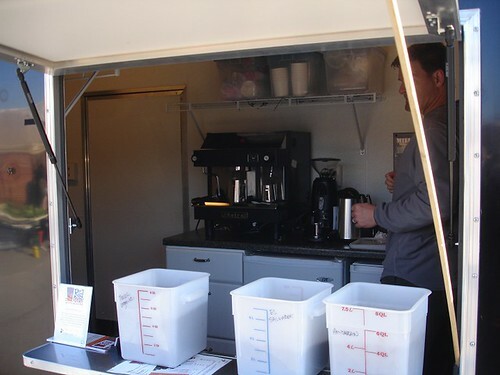 They have been coming to the farmers’ market for about three months now but they also offer free home delivery in the Raleigh and Wake Forest area and are scouting out other local spots to sell brewed coffee and beans. Red Rooster is a “micro roaster” meaning they roast small batches to order so their beans are always fresh. The coffee beans they were selling at the Farmers’ Market on Saturday had only just been roasted the day before! On this particular day they were offering beans from Hondurous, El Salvador, and a decaf roast. I ended up getting a half pound of the decaf roast and had a sample of the Hondurous coffee which was excellent. As an added plus most of their coffee beans are either organic, fair trade, and/or rainforest alliance certified. As you probably kow he cost of coffee has been creeping up over the past year, but the Red Rooster coffee bean prices are excellent at just $6 for 1/2 pound and $12 for a full pound of beans and decaf at $7 1/2 pound and $14/pound. When you purchase their coffee, the beans are packaged in a biodegradable paper bag. 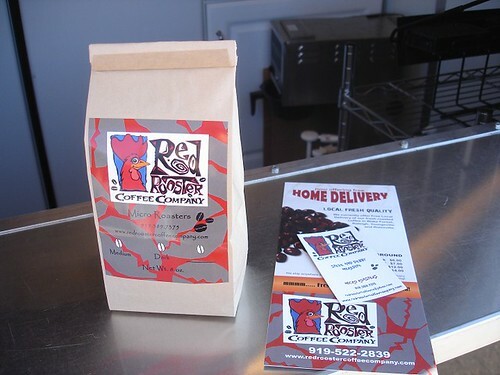 You can read more about red rooster coffee company on their website and facebook page. 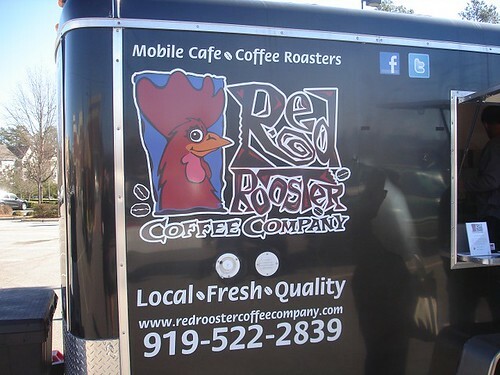 The folks at Red Rooster do special events and are on the lookout for additional locations to offer their coffee so give them a shout if you want them at your place of business and don’t forget to check them out at the North Raleigh Farmers’ Market each Saturday from 9am-12pm! Carrie, Let me know what you get and how you like it. I picked up some decaf and it is excellent. Pln to go back soon and get some regular coffee to try that out too!